The best way to eat dessert might be family-style. There’s something fabulously fun and simple about bringing a large dish of dessert to the table, putting it right smack dab in the middle, and telling everyone to dig in. And then experiencing the sheer joy of it all, bite by messy, delicious bite. Family memories in the making – in this case – gooey chocolate memories. 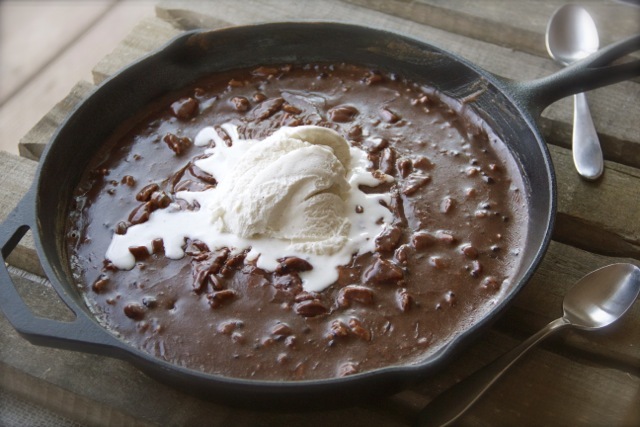 Five spoons + A hot, gooey pan of fudgy chocolate cake + Warm chocolate pecan frosting + Vanilla bean ice cream slowly melting on top = Three very happy kids and two very happy parents. Don’t forget the napkins. I can’t even tell you how difficult it was to stave everyone off while I took these photos. You’ll just have to imagine it. Leftovers are very very unlikely. Just saying. Preheat oven to 350. In a mixing bowl, stir together the flour, baking soda, sugar, and salt. Set aside. Place a 12-inch cast iron skillet over medium heat. Melt the butter. Whisk in the oil, cocoa powder, and water and bring it to a simmer. Remove it from the heat and mix in the dry ingredients until well combined. Whisk in the buttermilk, egg, and vanilla until smooth. Place the skillet in the oven and bake 15-20 minutes or until just set. As soon as the cake is out of the oven, begin making the frosting. In a saucepan over medium heat, whisk together the butter, cocoa, and milk and bring to a simmer. Remove from heat and whisk in the powdered sugar, pecans, and vanilla. Pour the warm frosting over the warm cake and spread gently with a spatula to cover.